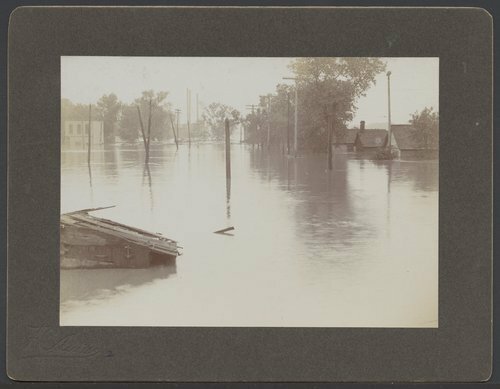 Thirty-three mounted photographs showing flood waters from the Kansas river in Topeka, Kansas. The heavy rains began in May, 1903 and the Kansas river went out of its banks on Memorial Day. Much of the low lying areas in North Topeka were inundated including the business and residential districts and farm land along the river bottoms. The water spread to sections of south Topeka and Oakland covering the areas with five to 25 feet of water. An approach to the Melan bridge across the Kansas river was washed out and a cable was strung across the river for use as a guide for supply boats. According to one account over 1,500 residences, 300 public and business buildings in North Topeka were ruined, leaving $2,200,000 worth of damage, and 24 people died.